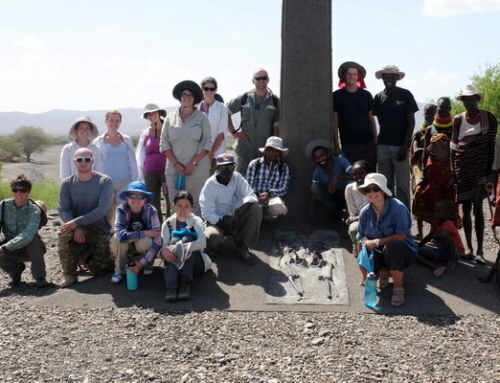 The students have arrived at Turkwel for their final adventure of The Origins Field School, the Archaeology module. 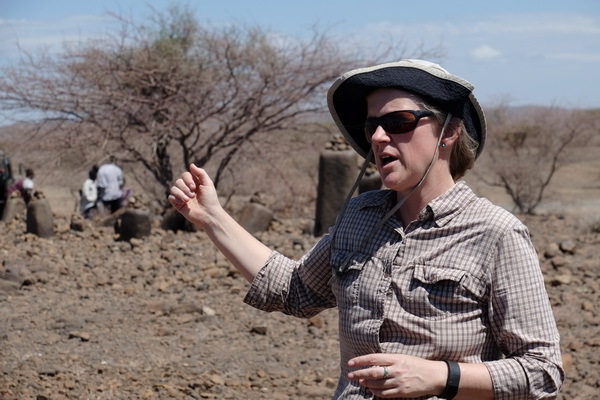 For this, we are joined by Dr. Elisabeth Hildebrand from Stonybrook University who studies the beginnings of agriculture and herding in Africa. 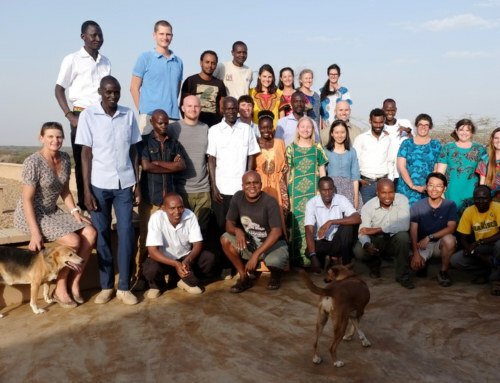 She has also done research in East Africa area for over 10 years! 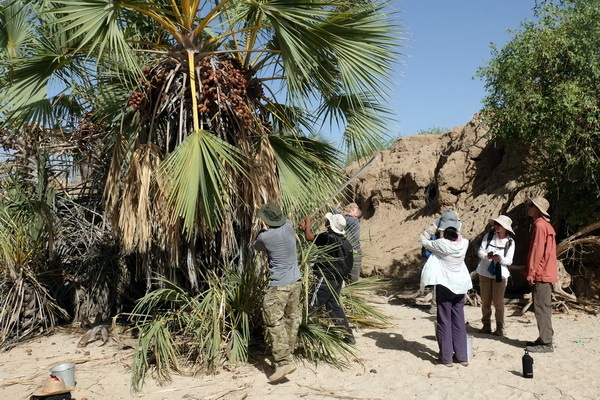 Dr. Hildebrand showing the students an archaeological site in the Turkana Basin. Photo credit Deming Yang. 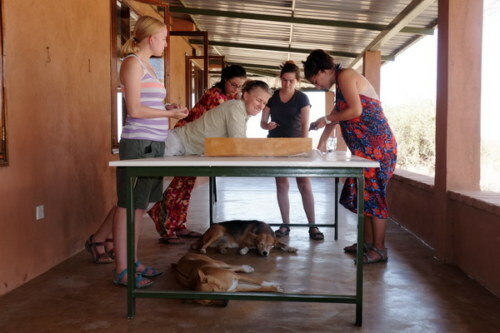 The use of tools is seen in many animal species, including the use of stones as tools in nonhuman primates. For example capuchin monkeys throw large rocks to at the nuts they collect to open them. Also, chimpanzees use a large flat rock, or an anvil, to rest nuts on while they use another hard rock, or hammerstone, to crack them open. 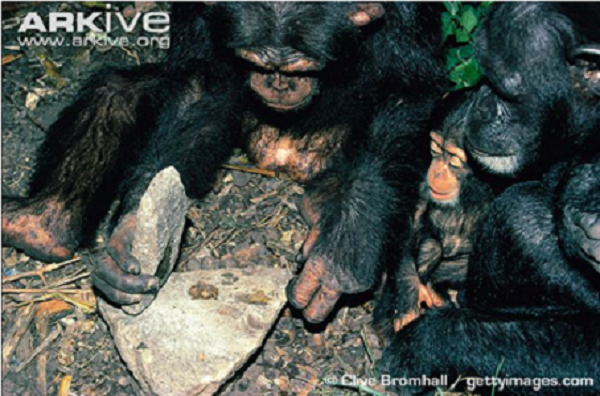 Chimpanzees using stones to crack open nuts. Courtesy of Elisabeth Hildebrand. 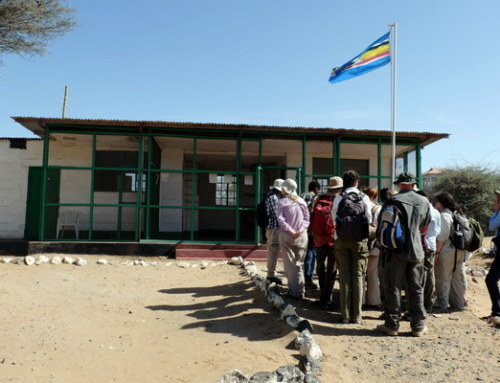 To test the students ability at collecting and opening nuts, they were taken to the bank of the Turkwel River where edible palm nuts grow on trees. 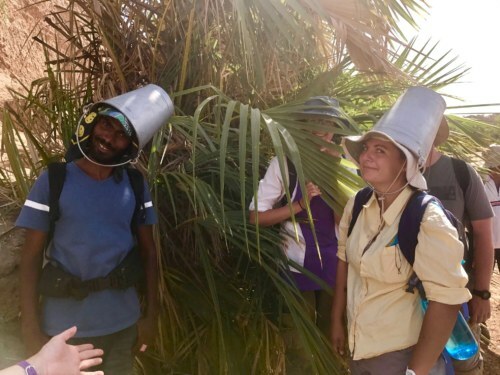 The students were only given buckets for collecting nuts and were told to collect as many as possible from trees that were taller than they could reach. Felix, Yared, and Charlie use palm leaves to hit nuts out of the tree. Photo credit Deming Yang. 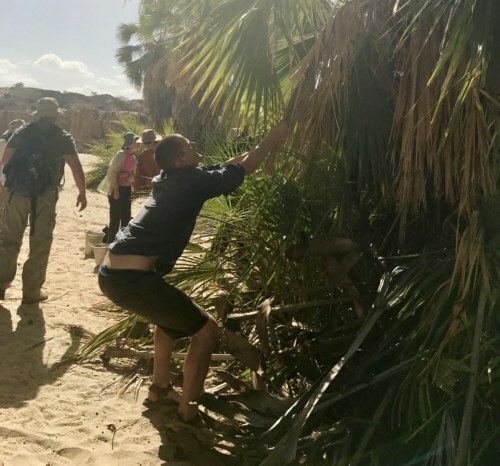 Throwing buckets at the palm trees does not seem to be working. 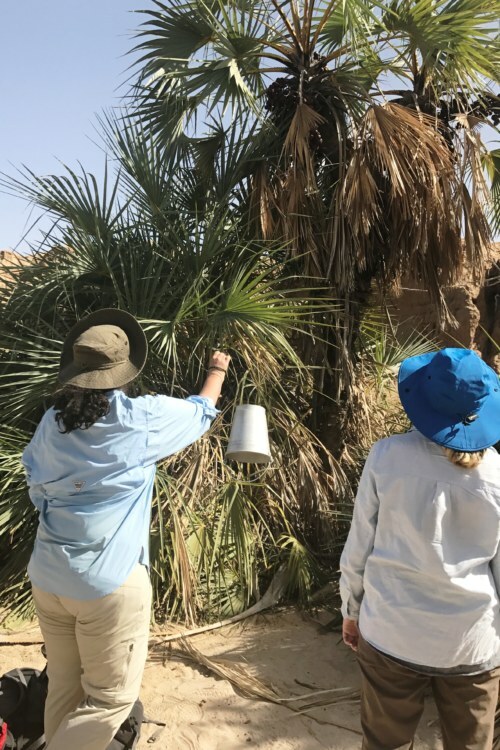 While the students tried many methods to collect the nuts, the ones that worked best was when they worked together by having some individuals hit the nuts off of the trees and others collected what had fallen. It was interesting to see the students quickly resort to using the items around them as tools! 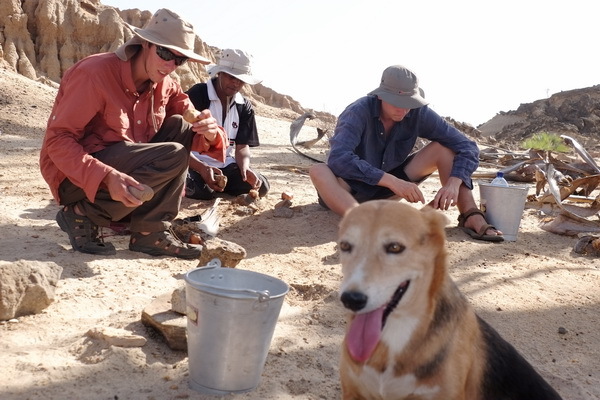 Students appear to have gone a bit “nuts” after collecting the palm nuts. However, the palm nuts were not ready to eat right after collection; the skin had to be removed first. 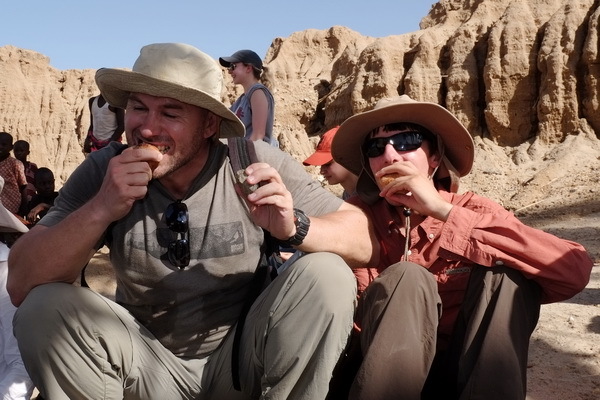 To do this, students picked up nearby rocks to try and get to the edible part of the nut. Students learning how not to open the palm nuts from each other! Photo credit Deming Yang. Students getting the hang of how to open the palm nuts. 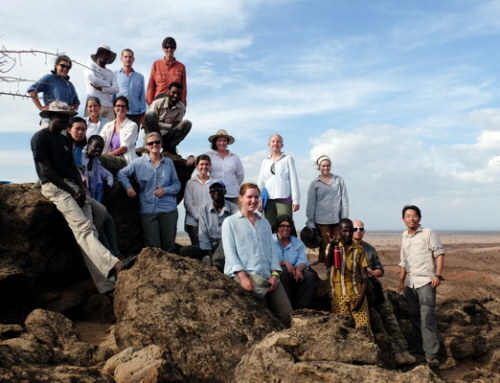 Photo credit Deming Yang. Finally! Photo credit Deming Yang. The students, overall, were able to use naturally occurring objects around them as tools to solve their problems in the palm nut exercise! However, this only proves that we have a chimpanzees ability to utilize naturally occurring objects as tools. In archaeology, we emphasis the importance of hominin tool use, but can chimpanzees do the same thing? 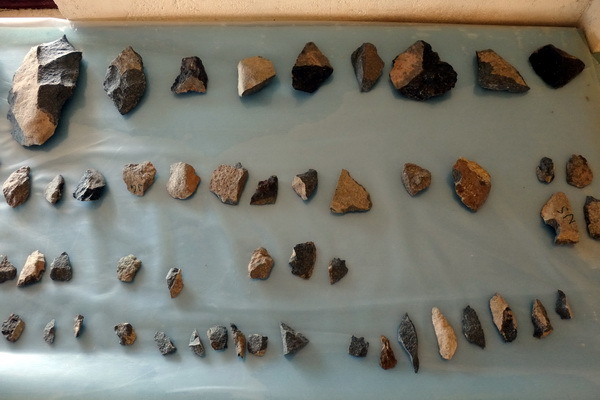 There is a big difference between using a stone as a tool, as chimpanzees do, and using stone tools, as hominins do. 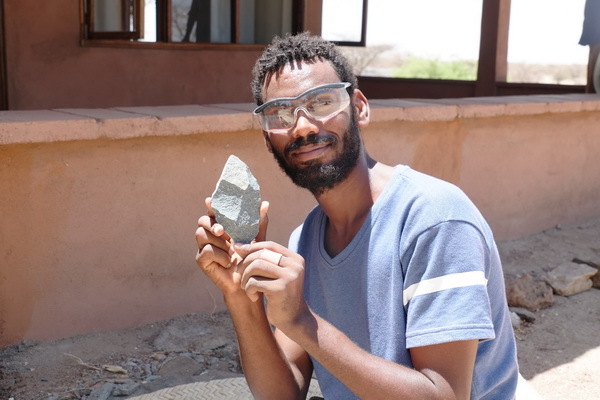 This is because the process of making a stone tool, or stone knapping, involves the modification of naturally occurring stone material with an intermediary tool to create an entirely different tool. Stone knapping is a skill that has been practiced by hominins for millions of years and appears to be a behavior unique to our lineage. Dr. Hildebrand shows students a variety of tools made by ancient hominins! Photo credit Deming Yang. However, the ability to know how and where to strike a hard material and have it flake in a way that produces a tool is not an easy one. An individual must have the mental capability and specific morphology to be able to locate and select a knappable raw material, sequentially plan and correct mistakes while making tools and be able to precisely handle and strike the raw material. 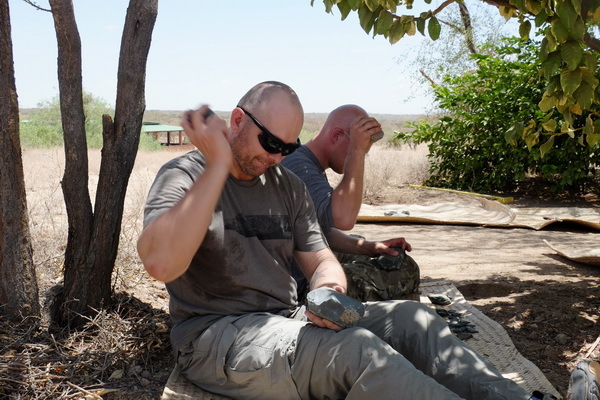 Thus the stone tools we see in the archaeological record provide evidence about the technologies, dexterity, mental capabilities of the toolmakers! 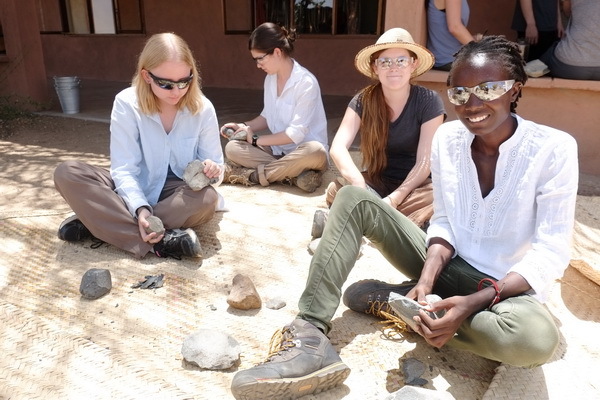 To test the students skills at stone knapping, our own Director, Hilary Duke, taught the students a technique of knapping known as direct percussion. In this technique, the knapper uses a stone hammer to apply force directly to the raw material. Hilary showing the students how to create flakes using the direct percussion technique. The flakes that come off of the raw material can be used as tools! Photo credit Deming Yang. Charlie retouching the flake he made to make it sharper! Photo credit Deming Yang. 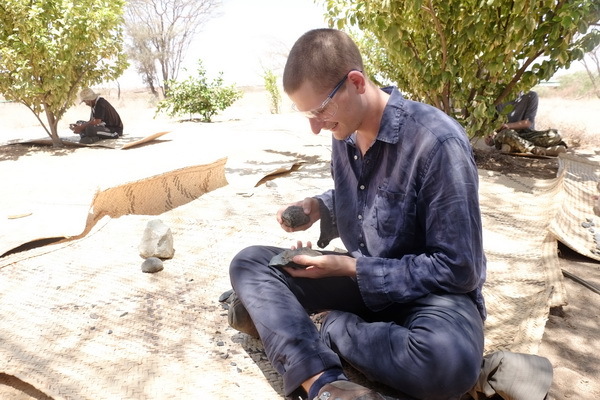 Tom using the direct percussion technique of knapping! Photo credit Deming Yang. Students making tools! Photo credit Deming Yang. Goitom shows off his tool! Photo credit Deming Yang. The final product. Photo credit Deming Yang. 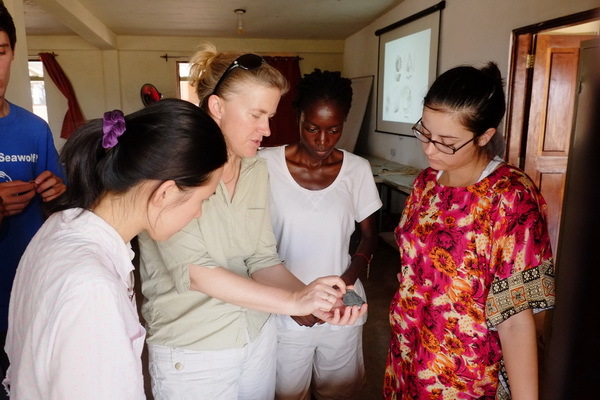 Dr. Hildebrand showing Yishan, Esther and Maria features of the flakes they produced. Photo credit Deming Yang. Leah and Andrew measuring the tools they created! Photo credit Deming Yang. 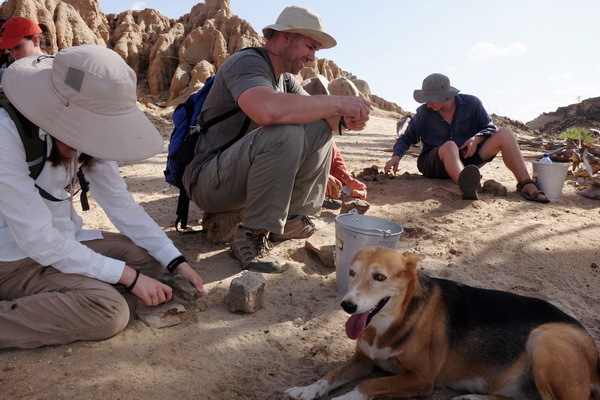 Since stone tools are less susceptible to destruction than bones, they not only preserve well in the archaeological record but offer the best evidence for where and when early hominins lived. 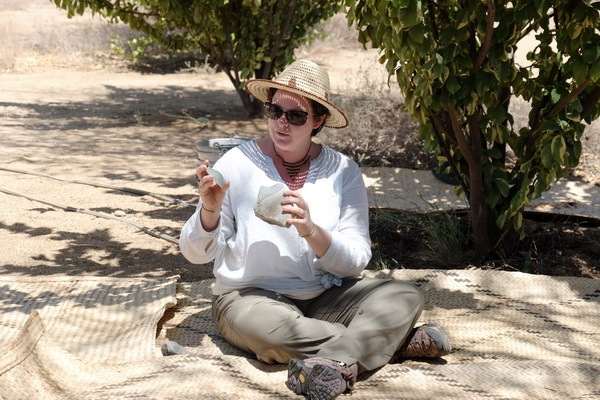 In addition, stone artifacts are the products of behavioral processes, and can give us an insight into the behavioral and intellectual capabilities of our ancestors. 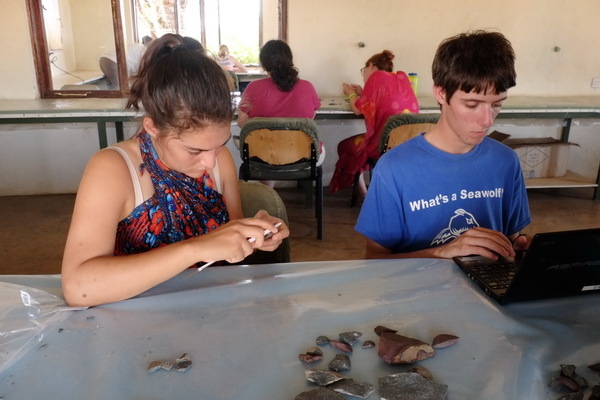 As our first week in archaeology continues, the students will further investigate the early use of stone tools as they camp in Nariokotome. Stay tuned! 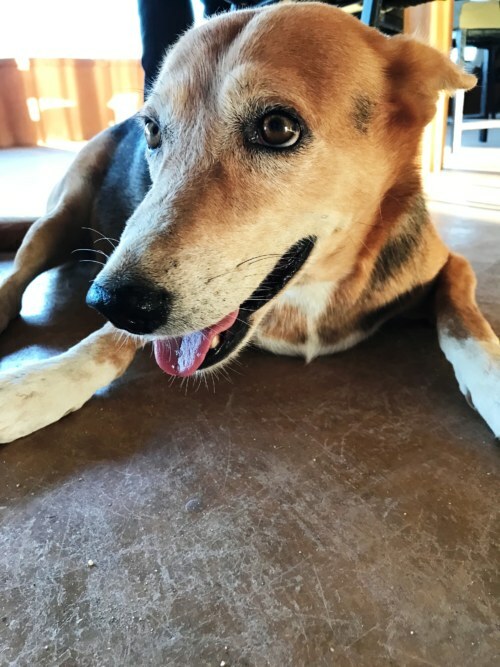 Meet Tom, a resident of TBI Turkwel. 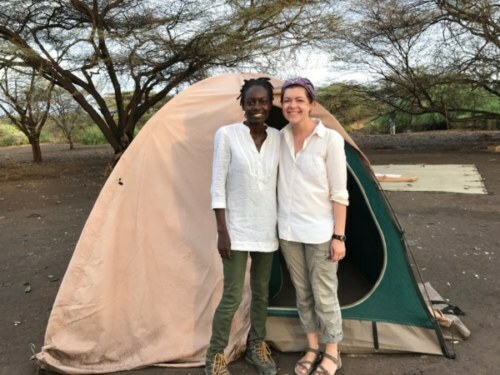 She has lived in Turkwel longer than the field school has been around!